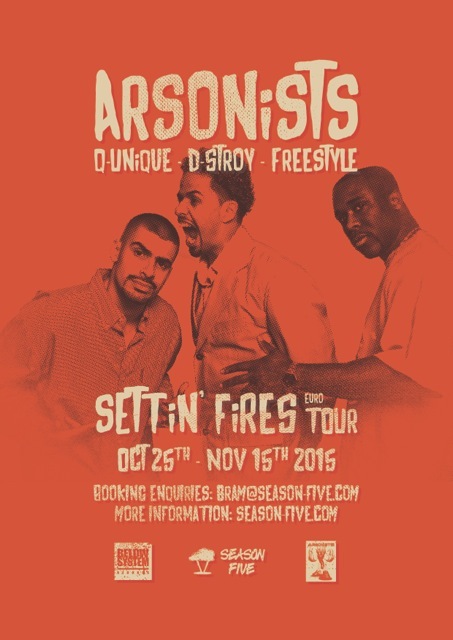 The Arsonists, is reuniting for an anticipated return to burn the stage. This group has gained worldwide recognition as one of the best “live” hip hop acts of all-time and they will be touring Europe from October 25th throughout November 15t. With these individuals forever linked through their association, this is your chance to see D-Stroy, Freestyle and Q-Unique, Live. They’re Fired Up to perform their classic hits and songs from their solo projects as well, comprising 4 powerful shows into 1 monumental event! This tour could not have come at a more appropriate moment, where Hip Hop fans and beyond want to be entertained. This tour will coincide with the release of The Box-Set entitled “As The World Burns”, will feature a liner notes book with dozens of group photos along with 2 CD’s. 1 CD will have an assortment of Arsonists classic singles and fan favorites from their critically acclaimed album “As The World Burns. With CD 2 fans featuring New and Unreleased material. Timeframe: October 25th – November 15th. Would you like to know about our upcoming tours, shows and other endeavours? Subscribe yourself to our e-mail list.